What began as a student walkout against tuition hikes has become a society-wide uprising against austerity, inequality and the police state. What started in the bitter winter as walkout against a $1,625 tuition hike in Quebec has turned into a spring of mass social unrest, sparking Canada’s first major uprising against the austerity measures that have slashed social spending and public services around the world. Now entering its fourth month and with over 160,000 college and university student supporters, the protest is North America’s largest and longest-running student strike to date. But it has become much more than that too. The government’s refusal to negotiate with students over tuition and its new law curbing the right to protest has angered millions and transformed the struggle. Now it is about stopping premier Jean Charest’s Liberal government, who students—heavily backed by labor, civil society and community groups—accuse with tearing up Quebec’s social contract. An atmosphere of defiance now cloaks Montreal, Canada’s second-largest city, as people of all ages don red squares—the symbol of solidarity with the strike, originating from French expression of being ‘squarely in the red’ financially. The balconies of the city’s distinctive townhouses are dotted with red banners, and nightly pots-and-pans protests ring out through Montreal neighborhoods as they bring thousands into the streets. Inspired by the protests against austerity measures during Argentina’s 2001 economic collapse, these casseroles are the latest form of protest by a movement that has taken inspiration from the Arab Spring, Occupy Wall Street and Spain’s Indignados. “Our generation in Quebec [has been perceived for a while] as a cynical or nonpolitical generation,” said Gabriel Nadeau-Dubois, the spokesperson for CLASSE (the acronym for the coalition of striking student unions). “Now we are beginning to see the other face of this disillusionment—not cynicism but a disillusionment that has become effective and demands social change,” added the measured radical. In the May 22 march of hundreds of thousands in Montreal, Nadeau-Dubois sees a movement of resistance. Dubbed by CLASSE as the largest act of civil disobedience in Canadian history, the May 22 outpouring of students, labor and community groups marked the hundredth day of the strike. It was held in defiance of what is known as the “Special Law.” Rammed through the provincial legislature on May 18 after the government made it clear that it would not compromise on fee hikes, the law bars protesting with fifty meters of campus buildings and makes illegal all demonstrations that don’t provide a route to police eight hours in advance. The law also suspending the semester at striking schools until August and imposes stiff fines on people that violate it. Even more crippling fines can be leveled against student and labor leaders, and associations can be found guilty of breaching the law even if they are not present at protests. It is also a crime to encourage anyone to defy the special law. Even before the law was passed, police were using batons, concussion grenades, tear gas, rubber bullets and mass arrests to end street protests, and enforce court injunctions against campus picket lines. As arrests grew to over 2,000, students increasingly hardened their resolve, and police charges have been met with returned tear-gas canisters, rocks and bottles. Concrete street planters were ripped up to build makeshift barricades. A vision of free, publicly accessible post-secondary education has strong roots in Quebec, where the concept of universal access to education is often seen as comparable to socialized healthcare. This common value is the result of the massive overhaul of post-secondary education in the 1960’s when, after mass student protests, the government created nine new university campuses and a free college system that was intended to open up higher education to those not part of the political and economic elite or clergy who then dominated Quebec. While tuition was initially justified to help cover the costs of the expanding campuses, students believed it would eventually be phased out. In the decades that followed, students struck numerous times in bids to maintain tuition freezes and to bring about tuition elimination. But this particular strike has taken on a dynamic of its own as the fight over education is seen as the frontline in a wave of austerity-inspired cuts. “In [the government’s] strategy to try and destroy the welfare system in Quebec, to destroy the public services, the idea of the tuition freeze and public education system is very central,” said Nadeau-Dubois over a coffee on a recent cool morning. For the government’s part, it has consistently insisted that rising tuition will modernize Quebec universities while describing the need to break the influence students have over education and social policy. Yet corruption scandals relating to the Montreal construction industry and a plan to open Quebec’s north to mass resource extraction has generated an image of a crony political elite that serves the economic establishment. The Quebec uprising has also utilized the decentralized social network mobilization of the Arab spring and the economic analysis of Occupy. “[Occupy] has put at the forefront of the student struggle the idea of the 99 percent and the 1 percent, the idea that there are a minority of wealthy elites that profit off the backs of others,” said Philippe Morin, a college professor with “Profs against the Hike” and former leading student activist during the 2005 mass student strike—the largest in North America until this year. 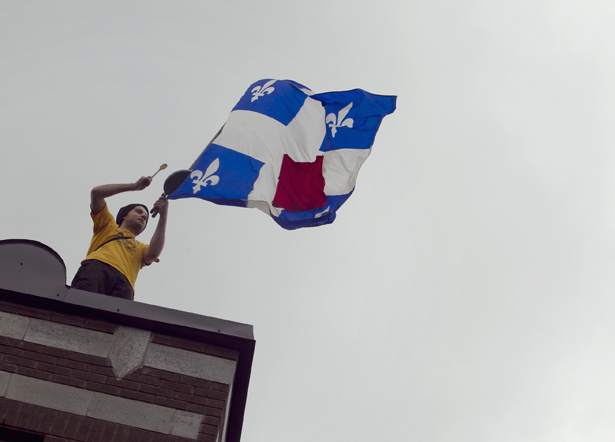 It is a point that was clearly visible across Montreal’s downtown throughout the city’s June 7 to 10 Grand Prix race weekend, when the polarization between the government and the people in the streets was as starkly drawn as ever. Although the festival brings in large tourist revenue, it is increasingly seen as a cultural manifestation of the inequality and elitism that the students are protesting. After calls to demonstrate by students and groups supporting the Arab Spring in Bahrain— where the first Grand Prix of the year was twinned with a bloody government crackdown—and a call by anti-capitalist groups to disrupt the festival events, police aggressively clamped down. Fanning out across the city’s subway stations—randomly stopping, searching and detaining people under 30 wearing red squares—police desperately tried to search through mass crowds to separate dissenting voices from race enthusiasts. As activists launched spontaneous flash-mob and casserole demos throughout Grand Prix street parties, riot police patrolled the surrounding blocks, attacking and dispersing anything that looked like the beginning of a protest. As social unrest continues with raucous nightly protests, the thousands of people clogging downtown Montreal have been joined by local casseroles. In turn the casseroles have given birth to their own local neighborhood committees run by general assemblies across Montreal. Nadeau-Dubois said that most students are so disillusioned with electoral prospects that they see little hope in elections. Now it increasingly appears that the showdown between the government and students in Canada’s largest fight against austerity will be decided in the streets.